Our new book comes out just about a month–April 26th–and today two super-advance copies came to us by mail. Believe me, it’s awfully strange to see something that has existed only as computer files suddenly materialize on your porch! We realize we haven’t given our new book a formal introduction yet, so here goes. 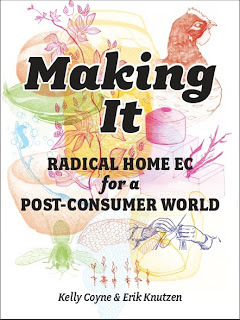 Making It: Radical Home-Ec for a Post Consumer World is our follow up to The Urban Homestead . The way we see it, The Urban Homestead was less a how-to book and more a “why should I?” Its purpose was to get people excited about this homesteadish stuff, and see that they could work toward self-reliance, no matter where they lived. 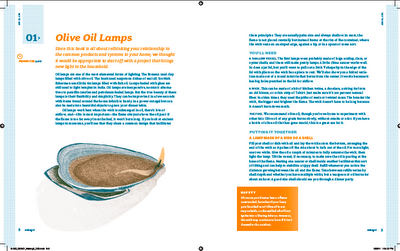 Making It is a pure how-to book: Project #1 – #70. There’s no chit-chat or opinionating. 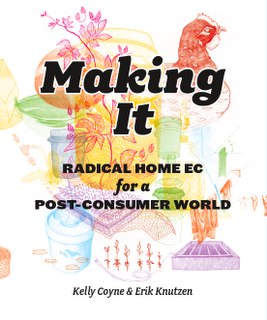 Its focus is on making the home an engine of production rather than consumption. The book is a little eccentric (like us) because it covers a wide range of subjects, everything from lotion to compost bins to beekeeping. So it’s not the ultimate resource on any one subject, but it is an excellent place to get started on a wide range of self-reliant activities. Since it’s about so many different things, we arranged the projects by difficulty, as well as by how often they must be done, rather than subject matter. This means the fast and easy projects are in the front, and the more complicated, infrastructure-type projects in back. This book was designed by the very talented Roman Jaster, and illustrated by the amazing Teira Johnson. As a result, it’s fresh and modern and easy to use. Our publisher is the esteemed House of Rodale. The whole team did a great job. It’s really pretty. And though it’s a paperback, it feels solid. Like you’re getting something for your money. Both Amazon and Barnes & Noble have it available for pre-order. I was shocked to see that though the cover price is $19.99, they’re both selling it for $12.14. I’m not sure if this is a pre-order special, or if that’s where they’ll keep it, but it’s a wicked good deal. Not that we don’t support indie bookstores!!! Including big ones, like Powells. LOVE Powells! LOVE to have an excuse to go there! This is so exciting! I can’t wait to receive my copy. Off to preorder it! 🙂 It seems it will be a wonderful companion to your first book which I loved! 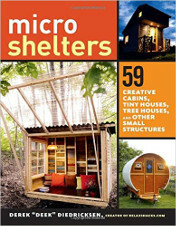 Just ordered the book, heard about it on the Survival Podcast. Very excited! Super Awesome! I picked up the Urban Homestead last fall and got really jazzed to start making some changes in our day to day. Looking forward to seeing the new book, and opening up some new possibilities for our family. I am sooo excited for this book to come out! I loved your first book, and enjoy reading your blog daily. You both are amazing. Looks fabulous, and I can hardly wait to buy it. Hope you covered rainwater collection…I’m looking for inexpensive ways to store lots of water to use in my garden during dry spells. I liked your idea in The Urban Homestead for storing rainwater in used IBCs, but haven’t been able to locate a nearby source, and shipping them is expensive! Congratulations. I hope there will be a book signing or release party to attend. Congratulations! I look forward to it, and also want to let you know that on your resources page the links to your books and other Amazon pages are broken. Or at least, they are from here. Cheers! Thanks for letting us know, Esther! How did that happen??? Oh, the mysteries of blogger. 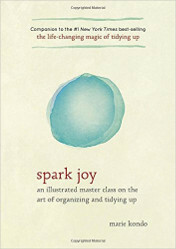 Perfect timing, my mom in LA has been pestering me to suggest a book she can get me for my birthday in April. Guess whose book she just pre-ordered for me?? Yay! Will it be available for Kindle? @AutumnRose: I don’t know. We’ll ask. I’d think it might be difficult because it’s so illustration heavy, and delicate color illustrations too, not bold black and white graphics. Kindle’s imagining is fairly primitive, isn’t it? @Tom: We are going to be up that way the first week in May! More on all that soon. @Everybody: Thanks for all your good wishes. It’s sort of nerve wracking, really, waiting for it to come out. Fingers crossed that you like it. Congrats! Just preordered it and bought your first book, too. Not sure why I didn’t have it in my collection already, as I’ve heard a lot about it! See you in Seattle in May? Can’t wait! Loved the first book, and am using the cleaning recipes now. I have a source of free pallets, so will be eager to read all about that project. I’ve been told they’re hard to work with because the wood is so dense. I’m looking forward to seeing this book in print! Thanks for giving everyone a heads up on the blog. Pretty cover but what really sold me on visiting Amazon.com to purchase a copy as soon as I’m done here…the sneak preview you posted here. 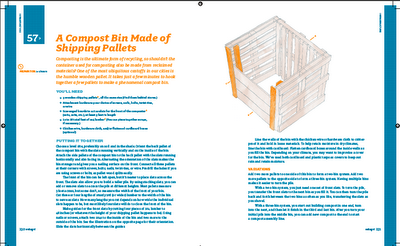 We recently made a shipping pallet compost bin and yours is way more elegant. 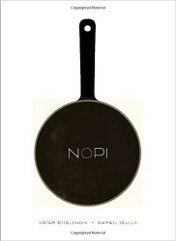 Thank you for your interesting blog chock full of good ideas. I enjoy visiting! Cool – see you in Seattle or Portland I hope! Wasn’t “Making It” trademarked by the producers of the ’70s sitcom slash David Naughton pop hit? Just asking. And just kidding. @Will: Yes indeed, Making It was a tv show/catchy pop tune–you win the prize! We actually tried to get our publishers to let us call it “Makin’ It” but for some reason they didn’t like that. Drat. Now that song is in my head. Just pre-ordered the book. Looking forward to it!